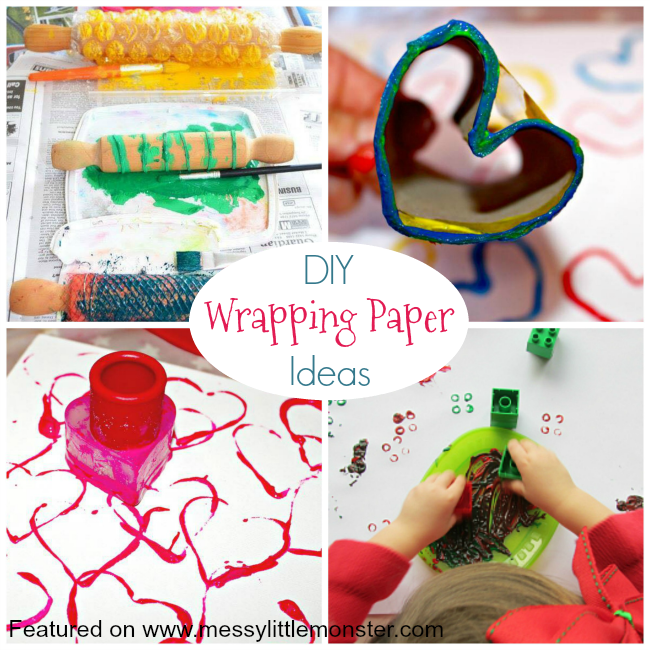 Here is a collection of easy DIY wrapping paper ideas, many of which are simple enough for toddlers and preschoolers to make. Gifts or keepsakes which the kids have made are always well received and wrapping them in homemade gift wrap or a lovingly made gift bag is a perfect finishing touch. As well as making your own DIY wrapping paper do think about making your own gifts or keepsakes for family and friends as they are always really appreciated, especially by parents and grandparents. Take a look at our ever growing collection of keepsake crafts for kids to make. Most of the ideas shared involve painting or printing a design onto large pieces of paper. We would recommend getting a large roll of paper to print onto or using brown paper bags. Take a look at the fabulous DIY wrapping paper idea shared below and click on the links for full details. Cover gift wrap with footprints and then turn the prints into cute pictures like on this reindeer wrapping paper. Use sponge shapes and print them onto gift bags. Once the paint has dried you can add details with pens and glue on sequins and glitter. Find different textures and wrap them around a rolling pin. Dip them in paint and then roll them across a large sheet of paper. Make some shapes from cardboard tubes and use them to print with. This is a fun way to make wrapping paper and help toddlers learn their shapes at the same time. Here is another use for large pieces of lego (duplo). Dip them in paint and then use them to print onto a roll of paper. The resulting pattern looks really cool! Use different shapes cookie cutters to print onto gift wrap or brown paper bags. Using a heart makes this a perfect wrapping paper to use for a loved one. 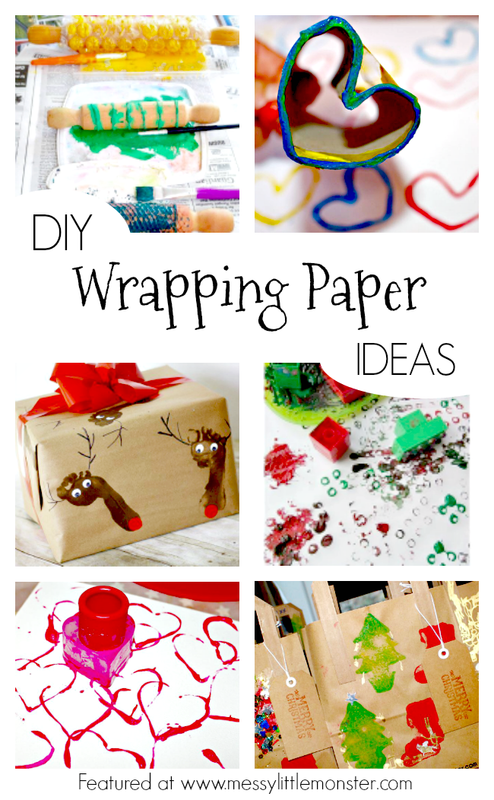 Have fun trying out some of these easy DIY wrapping paper ideas. What else could you find to print with? Take a look at our homemade gift ideas and all our keepsake gift ideas that kids can make. You might find the perfect gift to make and wrap for someone you love.